Political refugee, explorer, diplomat, newspaperman: all these aspects of his life help to make Ferdinand Lindheimer one of the more interesting early Texans. But it was his life as a botanist that most firmly secured his place in history. After settling in New Braunfels, Texas, he began building his reputation as the “Father of Texas Botany” by collecting, categorizing, and sharing hundreds of plants. Taxonomic changes over the years make it hard to pin down exactly how many bear his name today, but at least thirty seems a reasonable number, and there may be more. 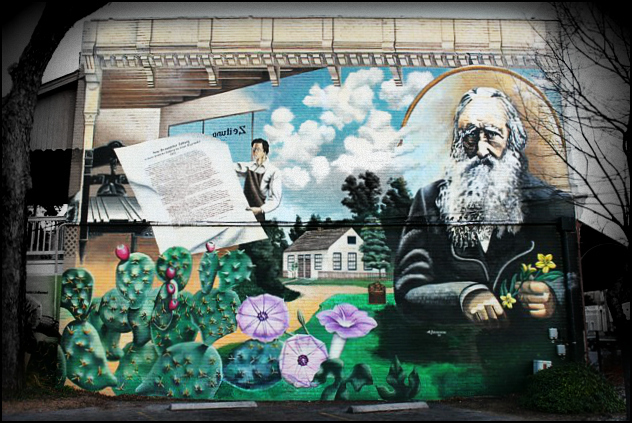 A mural on the west side of the Hoffman Building in New Braunfels, completed in 2001 by San Antonio artist Alex Brochon, shows Lindheimer holding a small bouquet of flowers: Lindheimera texana, or Texas yellowstar. Did you write my name among the stars with this little Asteroid? Did I serve botany in that way? Not by knowledge of it, but by love of this sleeping, dreaming daughter of Flora? Epaminondas died childless, and when his friends complained to him about this, he said, “I leave two little immortal daughters, the battle of Leuctra and the battle of Montinea.” So, if I die childless, then I shall nevertheless leave a little immortal daughter, the Lindheimeria texensis. A particularly delightful aspect of Lindheimer’s star is its ability to shine on even after its vibrant yellow petals have faded away. Its gone-to-seed structure is so pleasing, so appealing in its own right, I’ve often wished one or two had been included in Lindheimer’s mural bouquet. I’ve no doubt he loved even these dimming little asteroids. ***Note: Since posting, I’ve discovered that George Engelmann proposed the name Lindheimeria texana to Asa Gray, and told Lindheimer about that in March of 1842. In her book, A Life Among The Texas Flora, Minetta Altgelt Goyne ascribes the naming to Lindheimer, but that seems not to be so. More details can be found in comments to WOL and Steve Schwartzman, below. He was so interesting, and a bit connected to your Fredericksburg history through the Adelsverein. I’ve slowly been working my way through his letters to George Engelmann, and they’re fascinating. It would be great fun to work out his intinerary from Houston to New Braunfels, and “follow” it according to his seasons in different places. Maybe next year. Merry Christmas to you, and best wishes to Mary for a lot of penny-pressing in 2018. Following his itinerary: now that’s an idea! Great post, Linda. 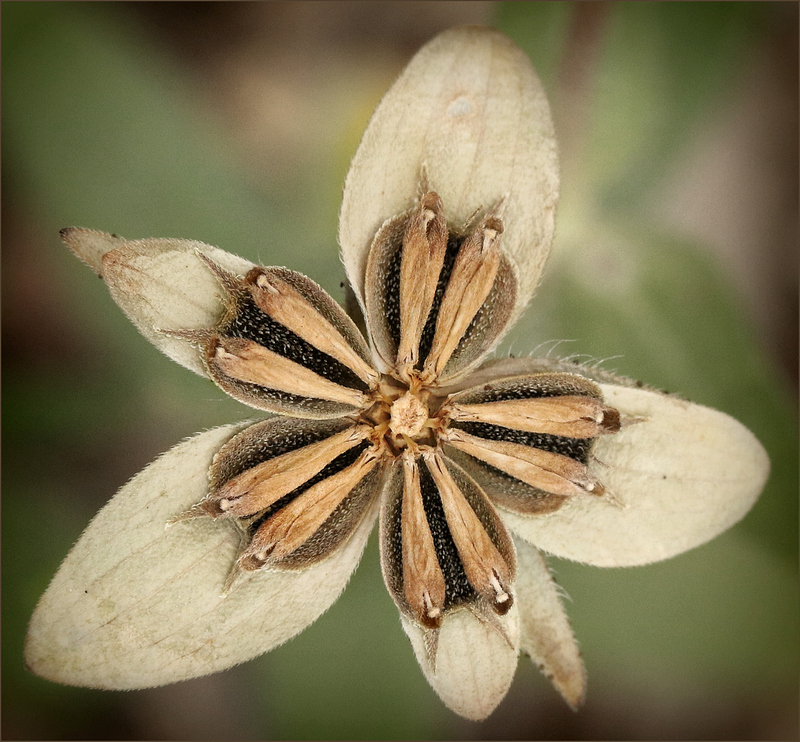 I’ve never grown Texas–Lindheimer, star, but it’s such a pretty and you’re certainly right that its seed pod after bloom is just as charming as the blush of bloom. We owe a great deal to Lindheimer –thanks for this profile. The photos of the plants are from the Willow City loop, but Wildseed Farm had several large, informal groupings of them tucked here and there when I visited, and they were delightful. I found several garden sites talking about how easy they are to propagate and grow, which amused me just a bit. If the great drifts of them on the Willow City loop were any indication, they don’t need much from humans except a plot of dirt to get started in, and perhaps some occasional water. It did please me to see Lindheimer holding the flowers in the mural. I guess the association he hoped for has taken hold. Evidently the taxonomic name has been respelled. When I searched for “lindheimeria texensis” it asked me if I meant, “lindheimeri texensis” without the “a” and showed me a cactus, albeit a very pretty one. Searching for “Texas yellow star flower” turned up the right one. That page told me its taxonomic name was “Lindheimera texana” and that it was indeed a member of the aster family. Thus, his “little asteroid” is a play on words, for which I like him even more. Even in the beginning, the spellings varied. In a March, 1842 letter from George Engelmann to Asa Gray, Engelmann asked Gray to examine the specimen. If it turned out to be a new species, Engleman wanted to honor Lindheimer by naming it Lindheimeria texana. It was in May of that year that Lindheimer referred to it as Lindheimeria texensis. You can find some references to it under that name online, but you have to browbeat Google and tell it that no, the spelling you entered is the spelling you want. Had the name proposed by Engelmann been settled on when Lindheimer wrote his letter, and he simply misspelled it — or was Lindheimer not sure how the name had been (or would be) formalized? That, I don’t know. In any event, it seems that the name came from Engelmann/Gray, and not Lindheimer himself. You’re right that another name change came along. 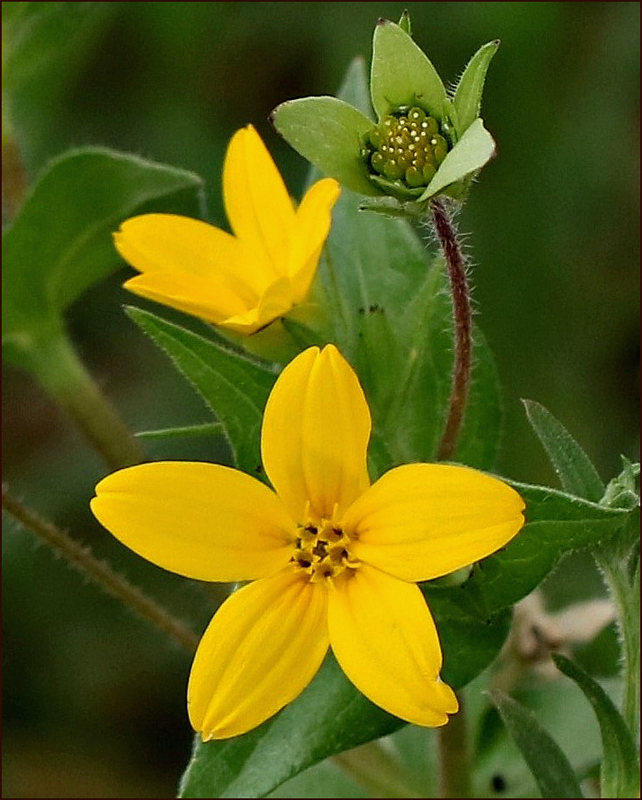 Above the photo of the blooming plant is the currently accepted name — Lindheimera texana — and just below it, the name by which Lindheimer referred to it in his correspondence — Lindheimeria texensis. No wonder we get confused! One reason Engelmann mentioned this plant specifically to Gray seems to be that the Compositae was Gray’s favorite family. Little asteroid – I love it! A very pretty flower, and how cool that the star survives in such attractive form! Many happy stars for the holidays to you! I still can’t get over the fact that I first found this plant in Arkansas. That state is part of its native range, but it wasn’t until I started finding it here that I was sure of what I’d seen. At least it’s one that I can identify even after the bloom is faded. My level of puzzlement increases exponentially in fall and winter, facing all those unrecognizable plants — but this one makes it easy! I’ve remained grateful to Lindheimer’s star for leaving remains that are so distinctive they make identifying the species easy. Would that it were so for all species. I assume the cactus in the mural is supposed to be Opuntia engelmannii var. lindheimeri (formerly O. lindheimeri), and the purple flowers Ipomoea lindheimeri. I’m sure your assumptions about the other plants are correct. I couldn’t find any of the plants identified in the multitudes of online articles about the murals. However, to the left of the cactus there’s a Texas rat snake (Elaphe obsoleta lindheimeri ) peeking out from under the leaves of a plant. I didn’t know that Lindheimer was the first to identify that species, too; he found the first one in New Braunfels. I would have missed it, had not a herpetologist posted some scathing criticism about the quality of the snake’s portrait. You can see the snake and read the herpetologist’s comments here. Since posting, I’ve found that’s right, and I’ve updated the post. I added some of the story in my comment to WOL, above. Another detail comes from this Harvard Ph.D. dissertation . Now I’m wondering whether “asteroid” was a bit of Lindheimerian word play, or was the word a synonym for the Compositae in those days? Between the gossip about other collectors (like Drummond) in Lindheimer’s letters, and all these references to “species mongers” and “scamps,” it seems the ranks of early botanists were more interesting than I’d assumed. The Greek-derived suffix -oid means ‘looking like,’ so Lindheimer could have been using asteroid in the literal sense of ‘looking like a star’ (in this case a stylized star). I don’t think it matters what field of human endeavor you look at, you’ll find some mix of scamps and honest folks. Even in science, where you might expect devotion to the truth, people have been found to have faked the results of experiments. On the coastal school playgrounds – and E. TX we called a little pink flower Texas-star. Actually it turns out that’s actually the prairie rose-gentian ( Sabatia campestris ). Needs sandy soil. Wishing you and Dixie the merriest Christmas. Guess what? Your pretty Texas Star isn’t so far from you now: well, at least it won’t be once it’s in season again. This photo’s from the Hall’s Bayou Fish Camp on 2004, but I’ve seen the flower at Nash Prairie, Brazoria WR, and Laffite’s Cove down on the Island. Of course, all of those places have sandier soil than we do — exactly as you say. I love the bloom, but I’m always taken with the star that remains once the bloom is gone. Both are beautiful. Merry Christmas and Happy New Year to you, too, Terry. I hope it’s wonderful, and that you have some nice, hikable snow. I’m glad you like the stars, Vicki. They don’t exactly twinkle, but they do have their own charm. Here’s to following our stars in the New Year. What a beautiful flower and what a lovely post! I hadn’t heard this story before, and I’m always tickled to learn something new — and you never disappoint, Linda! Such an appropriate time of year for stars. There are a lot of star-shaped flowers to enjoy, but I really do like this one. When I saw the mural with Lindheimer holding some in a bouquet — well, that was sweet beyond words, and I had to choose his “little asteroid” for this post. I’m going to have to start digging in the archives, I fear, or looking around for more seedheads and berries to photograph. The flowers have faded away — although I did see a clump of sunflowers still blooming on Friday. It was quite a surprise, but a nice gift, too. It seems that Lindheimer had two mortal daughters as well as the immortal one. Does anyone know what names were given to his mortal daughters? Floral names, perhaps? A fascinating story, Linda. And nothing to do with flowers but the name Epaminondas jumped out at me because it is a name which my parents have occasionally mentioned in recent years. As they have aged they have recalled many things from their early years, the story of Epaminondas being one of them. They both seemed surprised that their offspring didn’t know the story! I am referring, of course, not to the Greek Epaminondas, but the now controversial character in the children’s book Epaminondas and his Auntie. That’s an interesting question, about the daughters. I found that he had two sons and two daughters. One son was Max Eugene; one daughter was named Anna. Now I’m interested enough to dig a little more, but right now I have to go to work, so I’ll be back later. I enjoyed the google images of his house and garden. I’ve not been inside the house, but I have visited. The garden was quite lovely, although it was well into autumn when I was there. As to the family, I finally was inspired to go over to Ancestry.com, and that’s where I found this information about the children. The elder son, Eugene, was born in 1847. Son Florian was born in 1849, but lived only until 1855: six short years. Anna was born in 1857, but there wasn’t any birth date given for the other daughter, who was named Sida. I looked and looked at that name, and finally realized it seemed familiar because there’s a flower with the same name: Sida lindheimeri. I found one in September of 2015. The photo’s not at all good, but it tickles me that I have at least one image of it. I don’t have a clue how to figure out when a plant was given its name, but I found a journal article that included this information. It looks to me as though Lindheimer collected the plant in 1843 and 1844, and the information was published in 1845 after being named by Engelmann and Gray. That certainly suggests that the Lindheimers named their daughter after one of his discoveries: a delightful thought. I sent along an email to Steve, to see if I’d interpreted all that correctly. On top of everything else, I discovered that I can simply copy and paste citations from a JSTOR article. What fun! FRYXELL, PAUL A. “SIDUS SIDARUM — V. THE NORTH AND CENTRAL AMERICAN SPECIES OF SIDA.” SIDA, Contributions to Botany 11, no. 1 (1985): 62-91. http://www.jstor.org/stable/23909127. Thank you for finding so much information on the family. It’s lovely to have a connection between the daughter and the sida lindheimeri. And now I have located the meaning of Sida, according to Wiki “The genus name Sida is from the Greek for “pomegranate or water lily”. Carl Linnaeus adopted the name from the writings of Theophrastus. Thanks for adding that. I wondered about the meaning of the name last night, but when I looked in my dictionary of botanical Latin, it wasn’t there. Now I know why. And I hadn’t heard of Epaminondas: not the name, not the books, not any of the history. There’s always something new to discover. This is a beautiful mural and exquisite images Linda. I’ve come to know great things about Texas thanks to your cultured posts! Thanks so much, Maria. I am fond of that mural, with its image of Lindheimer holding a bouquet of his little stars. It seems that another flower played quite a role in his life, too: Sida lindheimeri. He had a daughter named Sida; the information about that’s in my comment to Gallivanta, just above. I’ve been reading some of his correspondence, and it’s clear that he regarded many of these plants with great affection. And it’s fun to read accounts of famous botanists doing their own learning through the years. As attractive as the dried seed heads are, I’m not sure how well they would last. I’m going to have to wait for the season to roll around again and do some experimenting. Some plants dry beautifully, and maintain their structure, while others end up drooping into oblivion. I do like dried plants. I have some dried basket-flowers that are holding up beautifully, and the grasses do pretty well, too. Renaissance Man is a good description, Curt. This brief bio from the Handbook of Texas Online gives an overview of some interesting aspects of his life I’ve never touched on. Even without their unique beauty, the lasting capacity of dried floral arrangements speaks to their value! I had not heard of Lindheimer so this was very informative. His star is brilliant and the dried version equally beautiful. The mural must be incredible in person, I would love to see it. Speaking of seeing, I now have a 36 inch monitor which makes things a little bit easier to see. The photos are amazing, print still difficult but better. 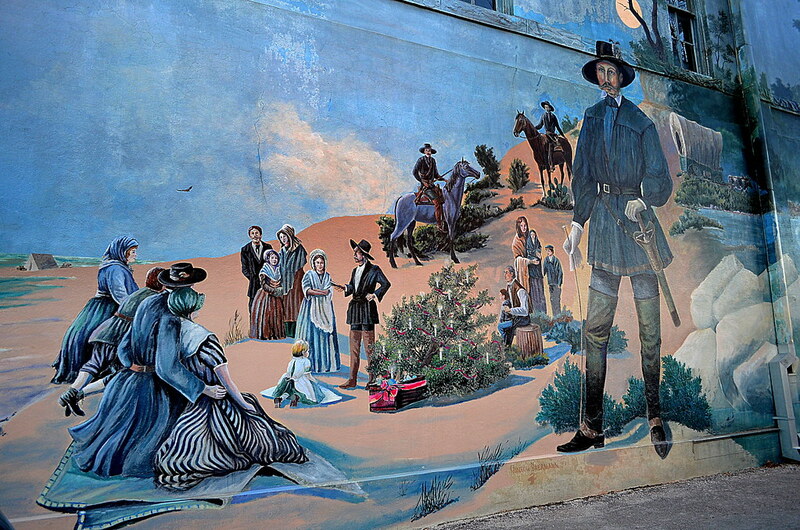 There are several murals in New Braunfels, and all of them are well done. Here’s another one that shows a Christmas celebration, with a traditional candlelit tree. I’m happy beyond words to hear about your new monitor. Size and screen resolution can make a tremendous difference, and it’s great that it’s helping you. Thank goodness we can compensate for some of our age-related difficulties. Even Dixie Rose has discovered that a nice heating pad helps with arthritis! I think I love the gone-to-seed version even more than the full yellow star. That’s pretty but the seed one is remarkable and so unique. Very beautiful indeed. The seed head really is unusual. I think I like it better, myself. There are a lot of pretty yellow flowers, but the dried version certainly has a different kind of charm. Another seed head I like is the basket-flower. I’ll be showing that in the future — so many flowers, so little time! I’ve long admired the love Texas has for public art, both in murals and sculptures. The fact that a botanist is so recently honored just delights me no end. There is a lot to admire. Some of the best art is hidden away, too — not publicly funded or done by “named” artists, but still worth seeing. I re-visted one of those sites recently, and discovered a little grafitti had been added — but carefully, off to the side, so as not to damage the art. It really was amusing; I’ll post about it here in a few days. I’ll look for that. I’m relieved to learn that it was done respectfully. I’ve often thought if I had a building in town I’d have the teenagers decorate it for me…within certain parameters, of course! I love Lindheimer plants and I hope more keep his name. I feel he know my ancestors as they were in the same parts of Texas at the same times for many decades and his grave is right by my ancestors Anton Pieper in New Braunfels Texas. I grow the Lindheimera texana, or Texas yellowstar along with many other native Texas plants, many bearing his name in my Leander Texas yard. I also have been to the UT Herbarium to see some of his specimens! One of the great pleasures of blogging is coming in contact with people who, in one way or another, have connections to those I enjoy writing about. Although I’ve been to Lindheimer’s home in New Braunfels, I’ve not been to his grave, and have that on my “must visit” list. When I go, I’ll look for your ancestors, as well. I browsed through your pages and found them fascinating. I love Texas history, and of course our state’s history is filled with interesting explorers and botanists. I’m glad you found something here to enjoy — and soon those flowers will be blooming again!